Today I went to Harbor Freight and bought a 12,000 winch, block pulley, heavy duty 5 drawer tool cart, 301 PC tool set, 6 gal 1/3hp 150psi compressor, 3ton Jack, and some other this and thats. Also order 24"x 40' of .0625 polished treadplate for runners. You bought a China made winch? Good luck with that. Didn't your other trailer have a SuperWinch? Was it still going strong? Mine is nearly 30 years old and still going strong and yes, it's been used and abused quite often. I have a Superwinch 4500 in the trailer I sold, and a Smittybilt 9000 on the enclosed. Badlands 12000 is the same as a Smittybilt made for Harbor Freight. The jeep an 4x4 guys like it. All the comments from the Jeep forum were from 2013 with the oldest post being from 8-12. Sorry but I'm still not sold on China made junk. Let me know if its still running strong 2 years from now let alone 30 I'm sick of replacing stuff that was made in China in the last 10 years or so. I do have a couple of vices that seem to be very well made but they both were made 30 years ago. I truly believe they 'used' to make good stuff but seems like anything that's made for export to the US these days is junk. Last edited by Cranky; 02-16-2014, 07:28 PM. I would think synthetic rope is easier to handle plus it doesn't kink like wire rope does and conforms to whatever it is that you need to tie onto but most times, a hook with a sling is used to latch onto an axle etc. The wire rope on my winch is still nice because I don't wrap it around axles etc so there's no kinks or breaks in it. Looks like a great trailer. I have been wanting to upgrade mine to one with a longer rear door ramp and A/C. who is hatin on the trailer? I only said I don't like China made crap referring to the winch BK bought from China Freight. I'm not trying to hijack BK's thread but what size synthetic rope would you use for a 3600 lb stocker?? 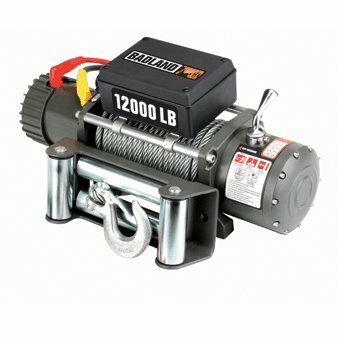 I had read quite a few winch and synthetic cable reviews. There are good and worthless synthetic rope. If I were to go that route I'd use Warns 10,000 a but it costs hear as much as a winch. 99 bucks.. Saw this while at Jeff's 4 wheel drive today..